Over the past several years, nutritional science confirms that Vitamin D3 may be the single most important nutrient recommended for supplementation. Vitamin D3, also called Cholecalciferol, is the same form of Vitamin D produced by the body when our skin is exposed to sunlight. Nutritional science is continually discovering far wider roles for D3 in supporting optimal health and wellness. In addition, recommended daily levels for Vitamin D3 have been revised upward. Kevala® offers you a choice of two premium Vitamin D3 products. Both easily digested and assimilated into the body, in easy-to-swallow vegetarian capsules. As always, careful ingredient sourcing and attentive manufacture make a big difference, even with a single-ingredient nutritional formulation. Rely on Kevala® for your Vitamin D3: vegetarian and assay-tested for purity and potency. We are grateful that many Kevala® Customers enjoy learning about nutrition in order to make wise choices about their supplements and other health-related matters. Whether or not you stay current with nutritional science, you can depend on Kevala’s commitment to providing superior formulations that deliver the most responsible combination of quality and cost. 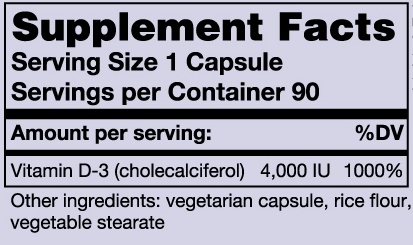 Suggested Use For Adults: One vegetarian capsule daily, with meal. Each bottle contains a ninety day supply. 100% Satisfaction Guarantee: If for any reason you are not completely satisfied, simply return to us within 30 days and your money will be cheerfully refunded (Less Shipping and Handling). The Food and Drug Administration have not evaluated these statements. This information and products are not intended to diagnose, treat, cure or prevent any disease. For all serious health problems, consult a qualified health professional. As we age, our bodies may produce this important nutrient less efficiently.